Deluxe is a word of French origin and is used to describe something luxurious or of a superior kind. Since the first release in 2007, the Sizzling Hot Deluxe1 slot has stayed on top of slot machine charts. Novomatic managed to do what others could not. Create a flawless looking slot themed on fruits and sevens. The second release in 29th of April 2013 included a visual update that turned it into the deluxe slot of today. The fast-paced style and attractive win combinations quickly picked up popularity in Europe and especially Germany. The Sizzling Hot Deluxe Slot brings entertainment for fans of the classic slot machine genre. Uses 5x3 reels and 5 pay lines with appealing sound effects and dynamic gameplay. For beginners, it's easy to pick up, for expert players hard to let go. The attached video of Sizzling Hot Deluxe shows the in-game looks and feels. Being a classic slot machine no overcomplicated features like Bonus Games, Free Spins or Expanding Reels were used. In less than 5 minutes more than 10 wins happened with the last one rewarding 400 credits on a 10 credit bet per spin. The betting system is very flexible, the minimum bet per line is 0.08 while the maximum is 20.00 per line. That makes the total bet range from 0.40 to 100 per spin. The RTP2 rate is set at 95.66%. In layman's terms, RTP translates to return to the player. Most players consider anything above 90% to be fair. Every time the spin button has pushed, the RNG3, also called the random number generation is used to determine the outcome of the spin phase. The RNG system offers to a slot, like sizzling hot deluxe the necessary security and reputation for players to trust. As long as a slot machine is trusted by its players it will be played and it will be successful. Nothing compares to the victorious feeling five fiercely flaming sevens can offer. Bringing up the Paytable tab reveals important symbol values and the general rules that define the Sizzling Hot Deluxe game. The player can set the bet for each line. As an example, we will be using a 0.20 bet per line, that makes a total bet of 1 credits to explain winning combinations. Win happens when 2 or more win symbols are put together starting from the left reel. A win is signaled by turning the symbols ablaze and flames showing in the background. There are a total of 8 symbols, the one with the lowest value is the cherry. Two cherry symbols make the lowest value winning combination, that on the said 1 bet, result in winning 1 credits. The mid range value symbols are the lemon, orange, and the plum. Obtaining 3 mid-range win symbols results in a 4 credit win. The scatter symbol is the yellow star with a red background, a 3 combination wins 2 credits. Grapes and watermelons are considered high-value symbols and collection 3 results in a 10 win. The highest paying symbol is the red 7. Landing 3 red 7's rewards 20 in winnings. Five red 7's or 77777 yields 1000 in winnings. In Sizzling Hot Deluxe every win can be doubled with a mini-game. This mini-game is called Gamble or double up. The player has to guess the right color of a face-down card, black or red, in order to double his winnings. A correct guess will double winnings from the spin phase and the gamble can be repeated. A wrong guess ends the Gamble feature and returns the player to spin phase. Like most slot machine games, Sizzling Hot Deluxe starts with the betting phase. The player must select the Bet for each line in accordance with total available credits or money. Having 500 total money and setting 100 per spin is the wrong approach! The right bet amount would be 5 or less per spin. The reason for this is simple, 5 spins could end up yielding nothing. Having 100 spins gives more chances for wins to happen. In games of chance, the best strategy is to go for the long run. Ideally, splitting up the money in equal parts to cover several days worth of play time. This, of course, means very low bets. Keeping a log or statistic also helps to determine the overall progress, this is how our team of editors analyze and keep track of all sizzling hot deluxe activities. The attached video shows in less than a minute how the original Sizzling Hot Deluxe 777 slot is played. Just like in real life, the player starts by taking a seat in front of a slot machine. The bet and spin phase followed by the Gamble feature. The simple system lets new players learn quickly and feel comfortable with the gameplay. Playing the free deluxe version of Sizzling Hot is easy and its perfect for relaxation bringing entertainment at every spin. The game mode, either free or real money work the same way. Using real money accentuates the risk and offers a thrilling experience. Our testers concluded that Sizzling Hot Deluxe can be played for real money in the long term, with a positive outcome. The opinions on bet value differ slightly. Bonuses are an essential part of modern online slots. In Sizzling Hot Deluxe's case, they come in many forms. The most popular is the Free Spins which allow players to effectively try out the game. Getting 50 or 100 free spins is easy, most sites offer that amount on new sign-ups. Cash bonuses come in two types first deposit and reload bonuses. First deposit bonuses are exclusively given to new members. In most cases, a 100% up to EUR 250 or more is promised on first deposit. For example, when the new guy deposits EUR 50 additional 50 is granted as a bonus. Reload bonuses work in a similar way but are usually smaller. Promotions for sizzling slots have an expiration date. A promotion like Battle of Slots allowed Sizzling Hot deluxe players to get progressive jackpot bonuses overtime during the event. Other types of promos can give away special prizes in the form of gifts. The Sizzling Hot Deluxe app was optimized by Novomatic GreenTube to run on all modern devices. There are no slow animations and frame drops, the game application runs smoothly. Our team has tested the Sizzling Hot Deluxe mobile version on four different devices, on the Novo Line - Novo Unity II platform. A Nokia with Windows Mobile and two android phones, Sony and Samsung Galaxy. The final test was on a Google Pixel 2 XL mobile. There were no issues the game ran perfectly on all operating systems. On tablets, Sizzling Hot Deluxe looks absolutely stunning. The colors offer a fresh look each time the spin button is pressed. The size of the slot becomes perfectly visible. Slots on all platforms were tested including Octa Games, Impera Line, Cool Fire II-s. 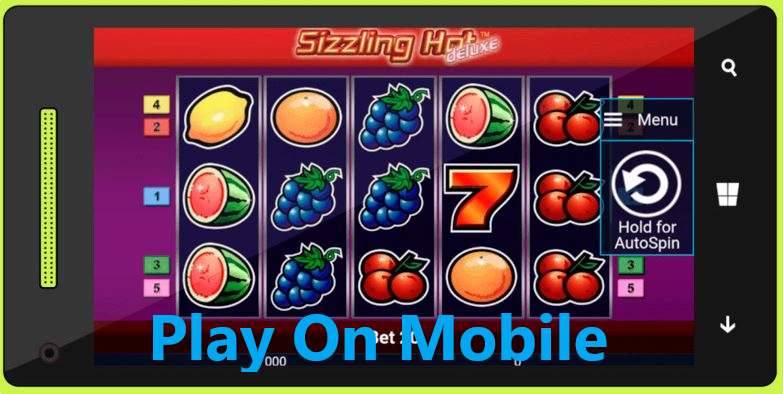 The sizzling slot apps ran perfectly and the team of testers has concluded that a tablet is a device best suited to play. Reginald's first 77777 Jackpot win at a local slot machine. Unexpected big win, submitted by Gaming Gear. Full cherries win at original Novomatic slotmachine by Siko. Very simple interface and gameplay. A perfect example of a classic slot machine with fruits. Well optimized for all devices, desktop, tablet, and mobile. No downloads needed instant cross-platform availability. Attractive 777 jackpot, rare but legendary winning opportunity. High payout rate set by the makers. A multitude of various bonuses available online. Gamble or Risk Feature included. Every win can be doubled. No modern features like Expanding Reels. Some bonuses can be restricted in various countries. Very few slot machines manage to appeal to the player they way Sizzling Hot deluxe does. The aspect of winning real money makes it exciting and adds extra replay value. Repetitive elements are essentially dwarfed by the jackpot and mega wins the game has to offer. During the evaluation on mobile and tablet, no problems were reported. It was noted that this slot machine with fruits seems to run and feel best on tablets. Audio wise there could be improvements. Winning sounds are masterfully executed and go well with the red-hot animations but music is non-existent. Having a pleasant uplifting soundtrack while the reels spin would be great. Having played all versions since release our team of expert reviewers has concluded that the Sizzling Hot Deluxe slot has passed the test of time. It's an extremely well-balanced fruit machine that can provide unlimited entertainment. In the near future, we plan to extend our inventory with more content updates on the deluxe version of sizzling hot as they happen. 1Sizzling Hot Deluxe is the brand name of the original Novomatic slot game initially released in 2007. The game had multiple latter releases from various subsidiaries including online and offline. 2 Return to the player refers to the amount of money a slot machine is set to give back. 3 A random number generator is a system used in slot machines to determine the outcome of the spin phase.